Does your organisation have an array of Executive Committees? Any data breach, accident or theft could damage your organisation’s reputation and customer confidence. Secure Collaboration Tools – but found they promised to align user, content and context to control access, but couldn’t control use or storage of sensitive content, especially on mobile devices. Of concern was that these tools were very new and you weren’t comfortable being an early adopter. 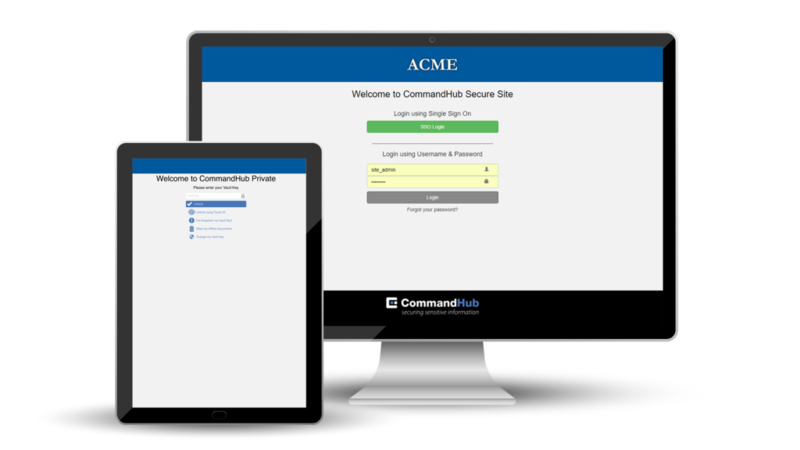 CommandHub is purpose-built for secure collaboration and is based on the Military Principle of multiple layered servers. As a result, it deploys multiple levels of document encryption and infrastructure protection. The CommandHub hosting environment is certified up to PROTECTED status by the ASD (Australian Signals Directorate). CommandHub protects sensitive information at rest, in transit and in use. Patented HubVault technology replaces insecure browsers with a double-encrypted file transfer tunnel. That way, collaborators can securely access and work with sensitive data even on smartphones and tablets. Data on mobile devices is double encrypted and, with the master key not stored on the device, mobile devices remain completely protected even if they’re mislaid, lost or stolen. CommandHub applies the Intelligence Community principle of compartmentation, restricting user access on a ‘need to know’ basis. 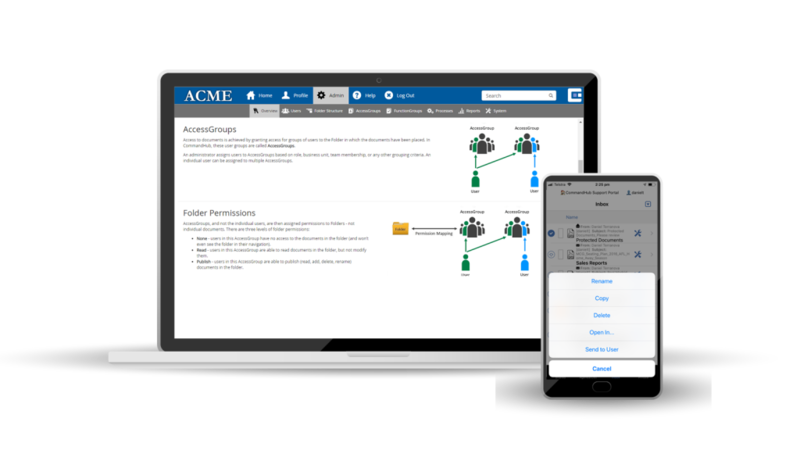 Your administrators can create multiple levels of compartments and set access and use controls for each, using the principle of ‘least privilege’. This granular control over individual compartments greatly reduces the amount of time, complexity and error associated with adding permissions at the file or user level. 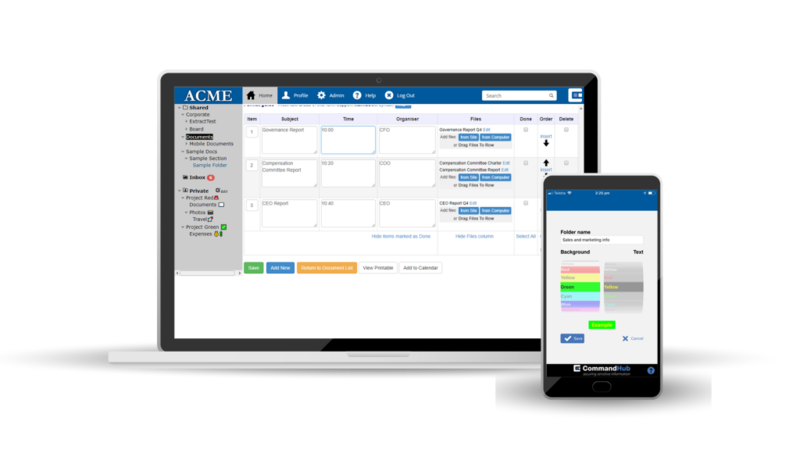 CommandHub makes collaboration easy for users and ensures that your organisation’s business processes are followed. You can set controls for who can see, edit or save a file, who can move or share it, and how approvals and rejections apply. You have control over the exact sequence of these steps, as well as version control, watermarking, file-locking and more. 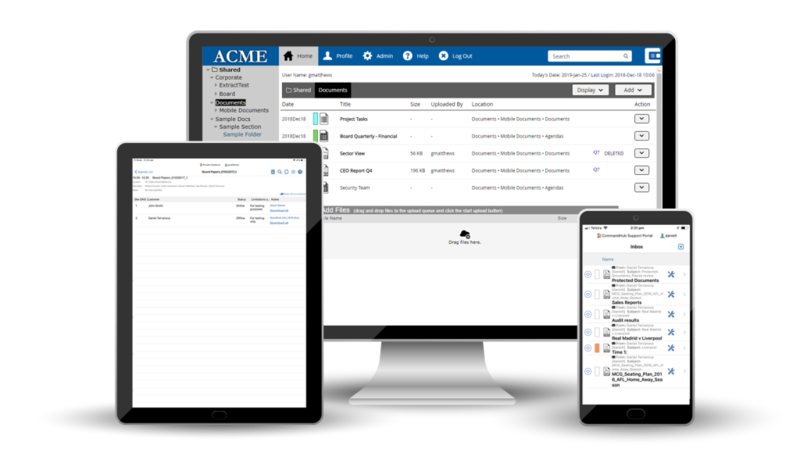 CommandHub was designed to be deployed by business users, with an intuitive interface for collaborators and no need for IT support. It usually takes no more than an hour’s training for your administrators to learn how to arrange content logically for your collaborators and apply controls to protect it. When circumstances change, they can easily make the necessary changes to the settings. 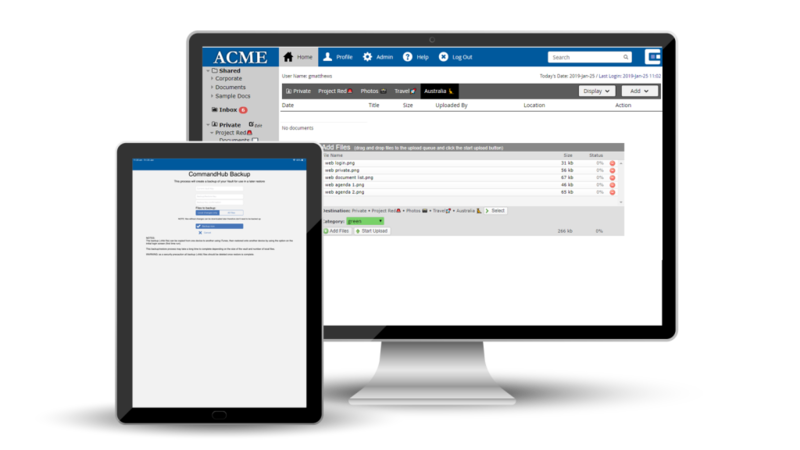 With over 500 configuration settings, CommandHub is easy to adapt to the way your organisation works. 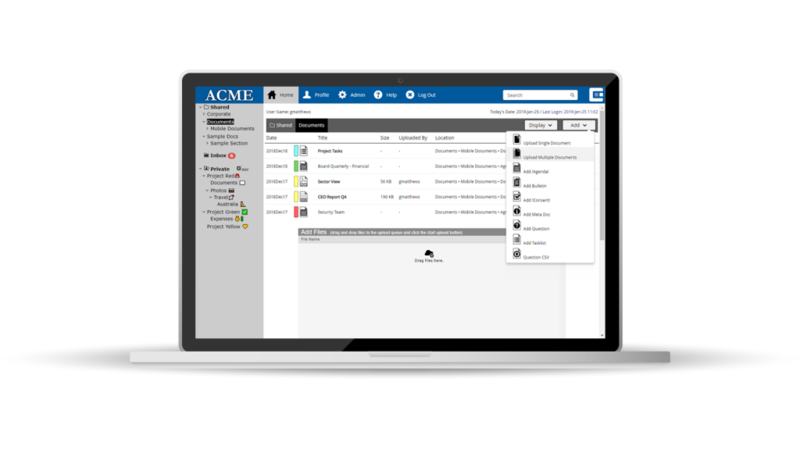 By turning on or off rules for files, access, use, formats and settings at any level, CommandHub makes sure that your critical data is fully protected without affecting ease of use for collaborators. CommandHub has been protecting sensitive content in demanding situations for more than ten years. Apart from Boards and Executive Committees, these include Government, Telecommunications Justice, Finance and Defence Contracting. Ask us about our case studies. 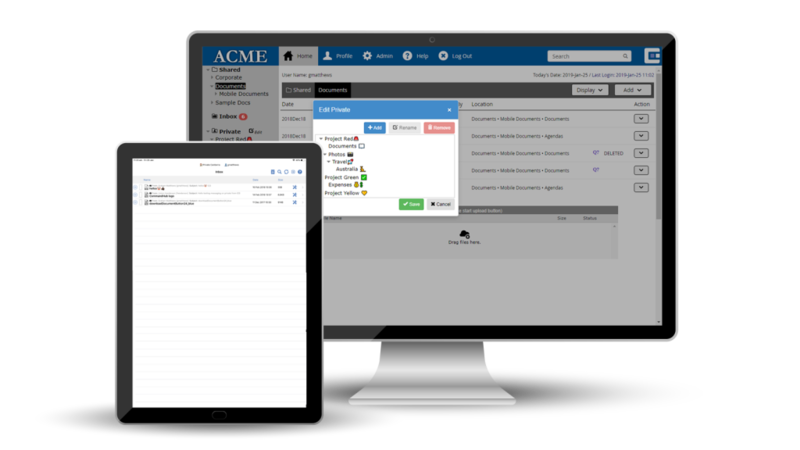 Contact us to discuss how CommandHub could ensure secure collaboration for your Executive Committees or Board.